Lincoln Builders of Ruston recently completed the construction of Community Trust Bank's new state-of-the-art banking center in Madison, Mississippi. A grand opening and ribbon cutting celebration was held January 22 at the bank's location at 1910 Main Street. Designed by Ruston architect Mike Walpole, the nearly 7,000 square foot single story branch building reflects the quaint personality Madison is known for. 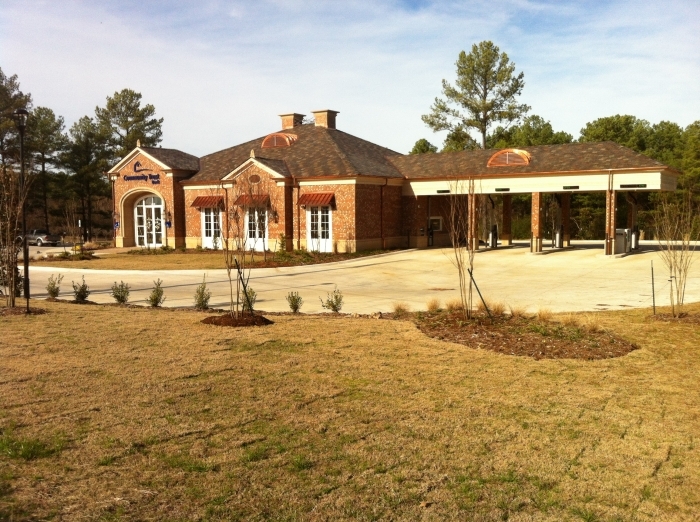 This is the second new location Lincoln Builders has completed for Community Trust Bank (CTB) in Mississippi. The bank’s Highland Colony Financial Center, located at 1063 Highland Colony Parkway, Ridgeland, opened in August 2012. A third location, CTB's Flowood banking center, is scheduled to open in March. CTB has plans for additional locations in the Jackson metropolitan market. Lincoln Builders appreciates the trust placed in it by Community Trust Bank, a century-old, Louisiana-chartered bank based in Lincoln's home town of Ruston, Louisiana. The bank provides a wide range of traditional banking services with 31 banking centers throughout north Louisiana, north Texas, and north and central Mississippi.